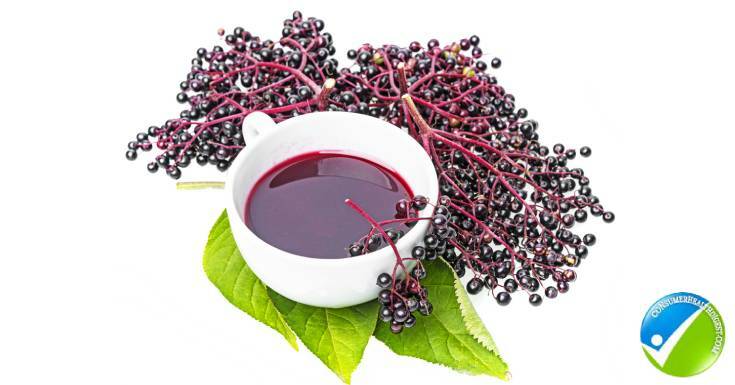 Elderberry improves our immune system, nutrient profile, skin and reduces our risk for chronic diseases. Elderberry is not a newly discovered options for boosting your immune system. It has become widely popular for its health benefits but people have been using it for hundreds of years all over the world. This superfood berry is typically found in an oral syrup or lozenge. Elderberry contains antioxidants that research leads us to believe: it relieves colds, the flu virus and will boost the immune system due to its powerful nutrient profile. 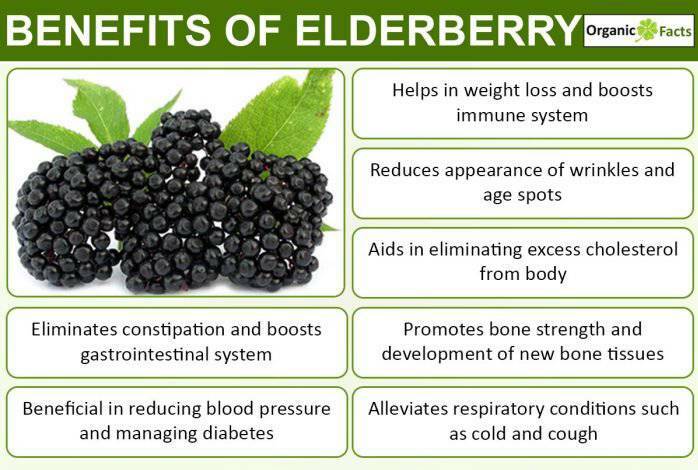 The studies and research available still need to be expanded upon and larger studies would definitely help boost and support the various elderberry health benefits. The current research results are extremely promising yet more extensive research needs to be tested on humans in larger quantities to be conclusive. Elderberry actually is different varieties of the Sambucus tree. This tree is native to Europe but it is also grown in other areas of the world. Several different pieces of the elderberry tree are used for medicinal purposes. Historically it was believed that the flowers and leaves were used for pain relief, inflammation and to induce a detoxification process like sweating. The bark was used to promote normal bodily functions such as production of urine, induced vomiting or even a natural laxative. Historical medicine practices use the berries or syrup to treat the flu, various infections, even nerve pain, migraines, chest pain etc. The deep antioxidant profile improves heart and circulatory function. A randomized study of approximately 50 people who took 15 milliliters of oral elderberry extract in the form of syrup with flu like symptoms had improved symptoms within a few days compared to those who only took placebo elderberry syrup. In addition to the study mentioned above an additional double-blind randomized control study reviewed the benefits of taking elderberry lozenges 1-2 weeks prior to traveling on an airplane. The research concluded that taking elderberry did not prevent sickness but those who took elderberry prior to traveling and still got sick had less severe symptoms and their overall sickness lasted for a substantially shorter period of time. The most common health benefits of elderberry include: boosting the immune system and reducing uncomfortable symptoms of the flu or a cold. An often overlooked health benefits of elderberry to take into consideration is the positive health benefits elderberry has on our skin. Elderberry contains potent amounts of antioxidants which are naturally anti-inflammatory, therefore they protect our skin cells from damaging free radicals that can contribute to skin issues including acne. These nutrients have potent antioxidant power found to be the most effective antioxidant. The antiseptic affects have been researched to show overall skin improvements. There are elderberry face washes to help reduce symptoms of acne and support these concepts. Elderberry also contains potent amounts of vitamin A which can not only prevent or reduce the appearance of wrinkles, it can ease the appearance of spots on the skin. Approximately 100 calories, 870 mg of vitamin A, approximately 400 mg of potassium, approximately 50 mg of vitamin C, almost 10 mg of folate, approximately 60 mg of calcium, and a little over 2 mg of iron. Not only are elderberries a rich source of the above vitamins and minerals they also contain a high amount of fiber approximately 10 g. Considering the daily recommended grams of fiber are 30 g, consuming elderberry extract can help you meet your needs for fiber with ease. Additional fiber can help improve digestion, reduces your risk for colon cancer, improve blood pressure and cholesterol while alleviating constipation. You have to be careful because elderberries can be toxic and raw elderberries can be very poisonous. If the wrong part of the plant is consumed this will lead to general nausea and possible vomiting and diarrhea. The stalks must be removed and the berries can be cooked in water and sugar then strained and cooked or boiled until it is a thicker consistency similar to syrup. Additional health benefits include reducing cancer risk, improving bacteria balance, improved immune function, and even anti-depressant tendencies. Elderberry has been shown to help boost the immune system, reduce inflammation, and improve overall quality of skin. The nutrient profile has an impressive amount of fiber, vitamins and antioxidants that will only improve your overall health and well-being.